After Windows 10 Anniversary Update, you have to enable "Developer mode" on the "Update & Security" page. Then go to Control Panel -> Program and Features -> Turn Windows Features on or off -> Windows SubSystem for Linux (Beta), and click OK.
Bash Shell is only for 64-bit versions of Windows 10. Ctrl + Left / Right: Moves the cursor to one word Left / Right. \w refers to the current file path. 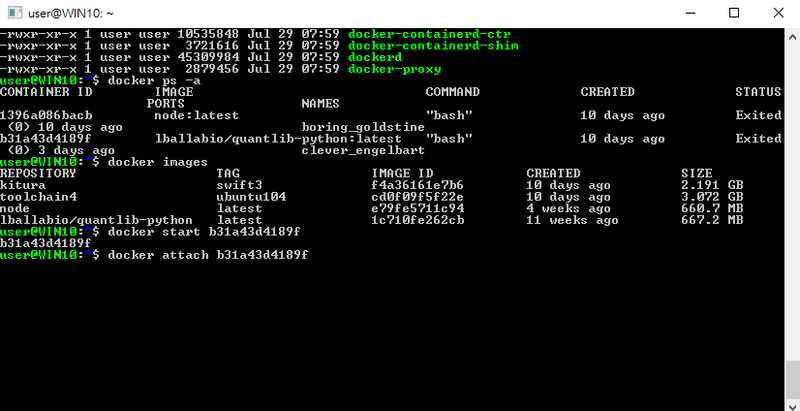 You can use Docker for Windows as engine and docker client for linux in bash. 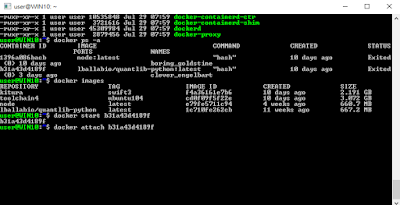 "Docker for Windows" requires Windows 10 Pro 64-bit and Hyper-V Package. You need to download and extract the development snapshot (Ubuntu 14.04) from swift.org and do these under bash shell. # download and extract node.js cd ~/ wget https://nodejs.org/dist/v4.4.7/node-v4.4.7-linux-x64.tar.xz tar xpvf node-v4.4.7-linux-x64.tar.xz # add path in ~/.bashrc export PATH=$PATH:~/node-v4.4.7-linux-x64/bin node --version npm --version # install mongo shell for version 3.2.8 # please refer to instructions here https://docs.mongodb.com/manual/tutorial/install-mongodb-on-ubuntu/ sudo apt-key adv --keyserver hkp://keyserver.ubuntu.com:80 --recv EA312927 echo "deb http://repo.mongodb.org/apt/ubuntu trusty/mongodb-org/3.2 multiverse" | sudo tee /etc/apt/sources.list.d/mongodb-org-3.2.list sudo apt-get update sudo apt-get install -y mongodb-org-shell=3.2.8 # if you follow the previous post on nodeapi.zip example # you need to install mongodb server on the Windows platform # in order to test that example. However, lxrun /uninstall then lxrun /install is faster. where different and multiple distros can be installed via Microsoft Store since Fall Creators Update (2017 Oct).